Annapurna circuit Trekking is wonderful in a sense that you walk along the Marsyandi River from the subtropical lowlands to the Manang basin. Then after crossing the Thorung La, we descend down to the deepest gorge in the world named Kaligandaki. The Annapurna range circuit is rich in bio-diversity and landscape. As Annapurna region is very much famous for its ecological diversity, it gives you the complete sense of real trekking. You will have an ample opportunity to observe the splendid scenery of beautiful mountains and amazing life style of the village people. The village life will keep you spellbound. Annapurna circuit Jomsom trekking commences from Besi Sahar and ends at Kaligandaki river valley at Jomsom. We reach Besi Sahar after seven hours continuous drive from Kathmandu . Besi Sahar is in Marsyangdi Valley River . Annapurna circuit Jomsom passes along the paddy fields and forest during the trek in that route. At the mean time, you will also notice beautiful scenes of the mountains, many waterfalls and cliffs of course. You will also come to observe the simple yet fascinating village life. The whole trek is so thrilling that you will never forget this moment through out your life. 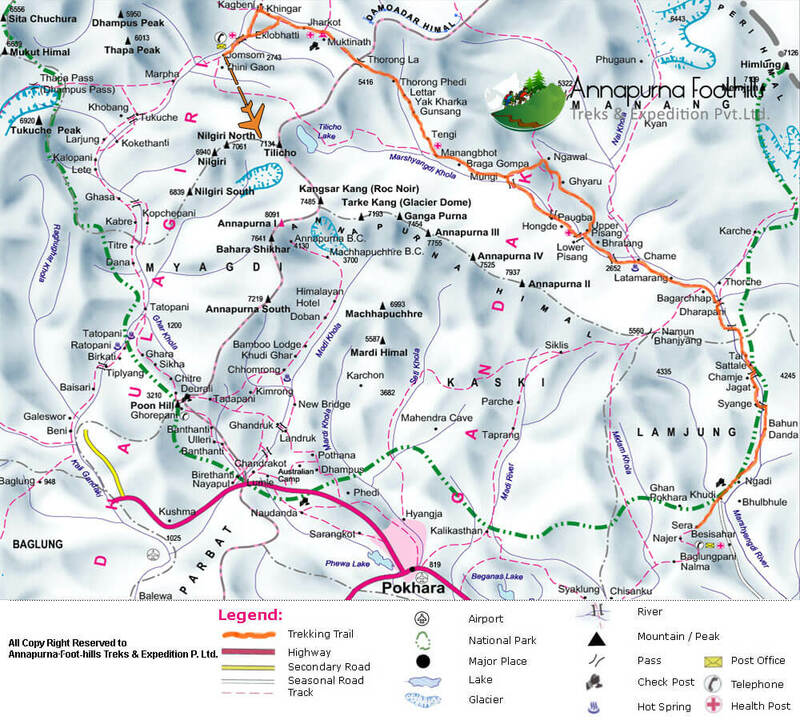 When to Trek in Annapurna region and Annapurna Circuit Jomsom? Ngadi, here we will have to cross the Ngadi Khola by a long suspension bridge. From here on the trail moves gently upwards to Bahundanda, an attractive village in the saddle of a long ridge at Bahundanda 1300m A steep trail descends from Bahundanda, through rice fields, before crossing a stream at the bottom of a small waterfall. It then climbs again and traverses the hillside high above the river before reaching the village of Hani Gaon. Ahead, the Marshyangdi valley forms a steep V-shape. We follow the winding mountain path down through Syange and along the river for some distance. The trail then climbs steeply and the path is cut into the sheer cliff-face some 200-300m above the riverbed. Eventually we descend to the stone village of Jagat, situated on a shelf, which juts out into the precipitous Marshyangdi valley. Overnight stay at guesthouse with breakfast, lunch and dinner included with Tea and Coffee. The trail from Jagat descends until it reaches the river and then continues through a lush forest. Further ascent leads to sharp-edged cliff facing the riverbank. En route, Chyamje comes into picture amidst the glorious backdrop of towering Annapurna mountain ranges. After crossing a suspension bridge, we climb steeply towards the slippery and physically challenging path to Sattale. On treading along a succession of rock-strewn trails, we descend to a grassy riverbank that leads to Tal. As we walk away from Tal, the path becomes rugged and winding. Then we approach steep forested village of Karte. Meandering along the waterfalls and cliffs, we finally reach Dharapani after crossing a suspension bridge. Overnight stay at guesthouse with breakfast, lunch and dinner included with Tea and Coffee. which takes about six hours. As you cut through a narrow field from the village, the Dudh Khola, which originates from the south face of Manaslu, enters on the opposite bank. The Marsyangdi then veers to the left, and as Annapurna II becomes visible ahead, you arrive at Bagarchhap, a Bhote village with prayer flags fluttering in the breeze around Buddhist monastery. Continuing to climb through forests of pine and oak, you pass through Danaque (2210m.). There comes a small wooden bridge which takes you to follow steep ascent path upto Timang. It lies at the bottom of Lamajung Himal. The trail goes through flat level until you reach Chame where there are government offices, shops, and hotels. Chame is the administrative headquarters for the Manang district. . Overnight stay at guesthouse with breakfast, lunch and dinner included with Tea and Coffee. Trek from Chame to Pisang (3100m.) which takes about five hours. With Lamjung Himal [6893m] sparkling in the morning sun, you set off for Pisang. The mountain disappears as you climb the path up the valley, passing a huge apple orchard. You continue through a fir and pine forest, climbing to a high, rocky area as the opposite bank becomes an impassable cliff. From this point the valley becomes extremely steep-sided as you follow the path to Bhratang (2950m. ).In the past this was the military station for troops who fought against the Khampa tribal revolution, but the dilapidated buildings are all that remain of that era. A short climb from the village brings you to a rock-strewn area where you cross a suspension bridge and follow a high, winding path, before crossing back to the right bank again. You now walk through a pine forest and as the forest ends, the valley changes from a V-shape to a gentle U-shape, opening up a wonderful vista before you. You can see the east peak of Annapurna II as well as Pisang Peak (6091m.) to the north-east. Continuing on, you come to a long mani wall by a bridge and the lower village of Pisang. . Overnight stay at guesthouse with breakfast, lunch and dinner included with Tea and Coffee. Trek from Pisang to Manang (3500m.) and it takes about five hours. 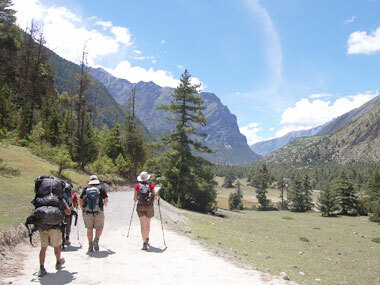 Beyond Pisang, the trail climbs a steep ridge which affords good views of the Manang valley and Tilicho peak (7145m.). Descending past Manang's airstrip at Hongde (3320m. ), you come to a level area from where the north-east face of Annapurna III rises majestically above you. From the wide plains of the Sabje Khola Valley, Annapurna IV [7525m] also becomes visible. Just beyond this point you cross the considerably reduced flow of the Marsyangdi Khola via a wooden bridge to the tiny village of Mungji. Cultivated fields appear on both sides of the path and off to the right, below a craggy mountain, you can see the village of Bryaga with its splendid monastery. Large chortens and mani walls abound and the tall peaks of the Himalaya spread out before you - Annapurna II, Annapurna III, Annapurna IV, Gangapurna [7455m] and, to the rear, Tilicho Peak [7145m].After a short steep climb you reach Manang which is a surprisingly large village for this remote mountain region. . Overnight stay at guesthouse with breakfast, lunch and dinner included with Tea and Coffee. After reaching Manang, we take a day off for complete rest and adequate acclimatization before crossing the Thorung La. We can spend this day strolling down the river to see the tremendous ice-fall cascading down from the glaciated mountai . Overnight stay at guesthouse with breakfast, lunch and dinner included with Tea and Coffee. Trek from Manang to Yak Kharka (4050m.) and it takes about three and half hours. Now the trail ascends gently all the way to Yak Kharka passing through the Gunsang (3960m.) village. En route, you can see panoramic views all the day.n peaks or by simply take in the panoramic beauty of the Annapurna mountain range and the Manang Valley. Overnight stay at guesthouse with breakfast, lunch and dinner included with Tea and Coffee. We have an early start today for the crossing of Thorung La [5416m]. The trail becomes steep immediately on leaving camp, but as local people have used this trail for hundreds of years, the path is well defined. The gradient then eases and after around 4 hours of steady climbing, we reach the chorten and prayer flags of the pass. From the snow-covered mountains above, to the head of the Kali Gandaki valley below and the brown and purple hills of Mustang, which spread out before us, we are presented with a dramatic tableau. The descent to Muktinath is a 1600m trek. But the excellent views of Dhaulagiri, more then makes up for the tiring journey. Eventually the moraines give way to grassy slopes before a pleasant walk along the Jhong Khola Valley to Muktinath, with its shrines and temple. Overnight stay at guesthouse with breakfast, lunch and dinner included with Tea and Coffee. Google Flights . Blockchain development with Incode Outsourcing professional.